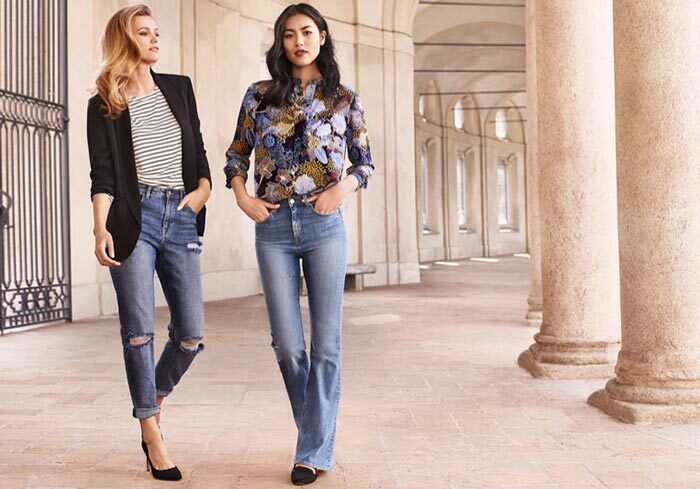 If you are you searching for something affordable and cheerful to say hello to golden fall, then you are sure to fall in love with H&M’s ‘Modern Essentials’ fall 2015 lookbook. H&M, one of the most popular fast fashion clothing retailers in the fashion world, will undeniably live up to all your expectations in terms of creating unique and spectacular looks throughout the upcoming fall season. Actually, this is not the first time that Liu Wen and Edita Vilkeviciute are featuring in an H&M lookbook, since the brand’summer 2015 swimsuit campaign was also spectacular and impressive with the two beauties channeling a comfy vacation style. This time around we are viewing a fashion plate with the two supermodels donning typical street style outfits for fall, looks inspired by the coolest fall 2015 runway trends. The collection is abundant in a wide variety of clothing pieces, including various denim designs, jumpsuits, ’60s-inspired suede and striped pieces, knitwear, as well as comfy footwear and bags. Talking about the colors prevailing in the lookbook, we can mainly observe a neutral and soft palette, which so perfectly goes with the mood of the breezy fall. H&M is obviously taking care of your different styles on different occasions. Having the lookbook at your disposal, you will not have to think long about your day-to-day ensembles whether you are going to drink a cup of hot flavored coffee in a cozy café or are invited to a friend’s birthday party. The girls dazzle us with so diverse and equally stunning style solutions that we even face difficulties in comparing them with each other and giving our preferences to one of them. Maybe you can cut a dash with the Lithuanian beauty’s outfit if you are working in a creative advertising agency. The blonde has created a combination of ankle-length jeans with ripped details and a long-sleeved striped top. This certain look is finished with a black masculine blazer, which has become the next must-have piece for the fall to come, and the tonal court shoes with pointed toes. The mixture of classic and casual is followed by a purely casual outfit showcased by the Chinese brunette. High-waist jeans with flared legs are successfully paired with a long-sleeved blouse with flower patterns imprinted all over it. What can be more suitable with this casual attire than loafers with rubber soles? The same texture with flower patterns is definitely quite a successful decision for a V-neck wraparound dress to be worn by Liu Wen, especially if it is finished with a fluffy olive knitted elongated cardigan. And if you are you still thinking on what else to pair your H&M jeans with, think a simple cotton shirt or a long-sleeved crepe blouse with a lace yoke. Another casual look we love so much on Edita is the skinny pants worn with the buttoned short-sleeve top and styled with a stylish jacket. In addition, H&M offers a myriad of warm and comfortable apparel options for your fall strolls in the city, like the flannel shirt, striped rib-knit top and striped cardigan, V-neck jumper and sleeveless turtleneck. The fast fashion company doesn’t ignore this year’s main trend, offering skirts and bags in imitation suede. H&M has not forgotten about your club look either. Be it khaki joggers in woven fabric paired with a simple top or a luxurious sleeveless wraparound jumpsuit your glamorous look and crazy mood are guaranteed.